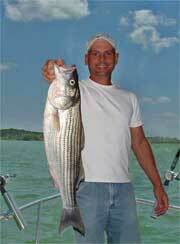 About Ray - Ray's Striper Fishing Guide Service. 512/825-8746 Friendly professional guide service Lake Buchanan Texas. Having fished all over Texas, I know that the best and biggest Stripers are at Lake Buchanan. I've fished Lake Buchanan for more than 20 years and caught many trophy sized fish on this great lake.